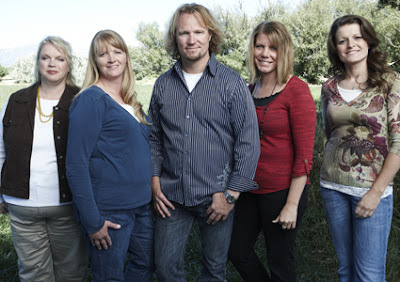 Savanna and Larry and I watched Sister Wives on TLC the other night. I'm so busy I hardly have time to shave both legs in one day these days. So why take time to watch what many call mindless trash? It was like passing a bad accident on the road. You just can't help but slow down and look. My initial reaction...something is really wrong with Kody Brown. Sitting there watching I said, "Man, this guy really has something wrong with him..." ("Duh!!!" Savanna says, incredulous. "Mom!!! Of course there's something wrong with the man!!! He has three wives and a girlfriend!!! What more do we need to see to know there's something seriously wrong?") Well, yes, but there's something even more than that. I'm telling you, I know it in my knower. He's got a serious personality disorder. Maybe narcissistic, and a great actor for sure. I didn't get the feel that this was reality TV as I do with some other shows. Everything he said felt like such a show. I wondered how in the world anyone would get away with a show like this since what they are doing (bigamy) is illegal. Yes, it's a 3rd degree felony. The answer is, they might not get away with it for long..they are already under investigation since the show has aired. He talks of "falling in love over and over and over again." There is no love about this...he's simply a man being led around by his lower half. If you watched it, what was your initial reaction? It was like a trainwreck - I couldn't look away! True Mormons would shun him, because of the polygamy thing - and FLDS people would shun him because he interacts with the real world, and his wives have jobs and don't wear prairie dresses and poofy hair. So...he can hide behind his "faith" all he wants, but the truth is, he would be completely rejected by any branch of the religion he claims to follow. I guess it's a plus that the wives were all of legal age at the time of their "marriage," and none of them were forced into it - but yeah...I can't even fathom how any woman would agree to such an arrangement. As my husband said, "Yeah, you don't share well!" I fortunately/unfortunately do not get the privilege of watching this because of our lack cable issue right now. But I can tell you this, this guy from what I have seen just on commercials and interviews is definitely "out there". But I wonder what these women are thinking! Seriously, do they just not feel they are worth having a husband to themselves? I mean the idea of another woman in this house...AIN'T gonna happen here! Talk about taking "adultery" to the highest level! I watched the last quarter and was was more bothered by the women who choose to devote themselves to this man. What in creation happened in their childhood/teen years to make them think that this okay? I'd love to know their family history.